L’Oréal has teamed up with designer Yves Béhar to create a wearable UV sensor that tracks sun exposure, as a way of lowering the risk of skin cancer. L’Oréal is launching the UV Sense at this year’s Consumer Electronics Show (CES) in Las Vegas. It created the wearable device to allow people to take more notice of sun safety, and in turn reduce the risk of them contracting skin cancer. It builds on a UV patch created by the company in 2016, which similarly tracked exposure to UV (or ultraviolet) radiation. “The technology within UV Sense is groundbreaking, and has so much potential to impact the future of technology and wearables,” said Guive Balooch, global vice president of L’Oréal’s research and innovation technology department. 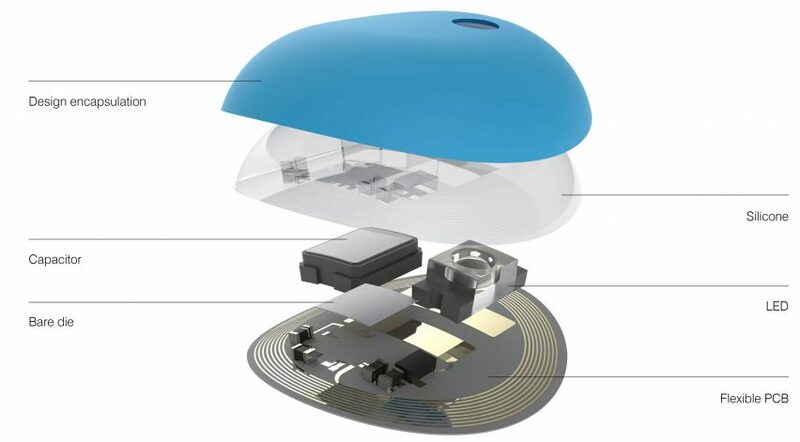 The small UV Sense device works without the need for a battery, so is relatively small in size – measuring just two millimetres thick, and nine millimetres in diameter. Users are instructed to place it on their thumbnail, as this is an area of the body that L’Oréal says receives “optimal sunlight”. Once attached, sensors deliver information about the wearer’s UV exposure to an app using Near Field Communication (NFC) – a wireless technology that works using magnetic field induction, and which is commonly used for contactless payment systems. The app then provides the user with information, from facts about sun safety, to warnings when they need to take shade. Records of a user’s UV exposure are also stored in a profile – encouraging them to look back and track their time spent in the sun. Yves Béhar worked with L’Oréal to come up with a design that they claim won’t be too distracting for the wearer. “Design and technology are inextricably linked, and as products become more personalised to individuals, both elements are integral to providing people with seamless experiences,” said the designer, who is also the founder of design studio Fuseproject. “By working with L’Oréal, we are able to pair deep expertise in beauty tech with an effective design that enhances consumers wellbeing without distracting from their everyday lives,” he added. UV Sense is currently on show as part of CES 2018, which is taking place in Las Vegas until 12 January. The show, where many of the world’s leading tech brands launch their new products, has also seen Fuseproject unveil a cube-shaped indoor security camera that detaches from its base.